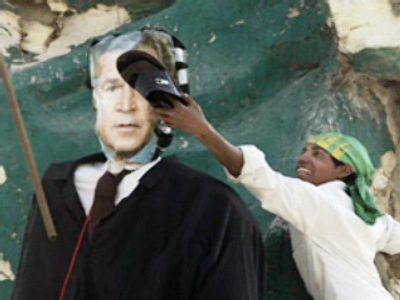 Thousands of protestors against the U.S. presence in Iraq have burned an effigy of President George Bush in the same square where they toppled a statue of Saddam Hussein five years ago. Most of the protestors were followers of the Shiite cleric Muqtada al-Sadr, who view the American military as occupiers. The demonstration comes after two days of heated protest in parliament by al-Sadr loyalists and other small parties arguing that the new security pact, which would ensure a U.S. presence in Iraq for three more years, was a “surrender to U.S. interests”. In a remarkable turn of events, the effigy, with a banner standing next to it reading “shame and humiliation”, was placed on the very site where fallen dictator Saddam Hussein's statue stood. It was torn down by U.S. marines and Iraqis in one of the most iconic moments of the Iraq war. Protestors stoned the effigy with water bottles and sandals. One man used his shoe to strike Bush's face. Eventually the image fell and was stamped on before being set alight. Crowds chanted and waved flags while the effigy burned. Security was extremely tight, with Army snipers present and al-Sadr loyalists all around as well. Al-Sadr's representative read a sermon calling the US “an enemy of Islam” and urging parliament not to pass the new security pact. “The government must know that it is the people who help it in the good and the bad times. If it throws the occupier out, all the Iraqi people will stand by it,” read the sermon. Among the crowds were protestors holding banners reading “No, no to the agreement of humiliation”. If the pact passes through parliament it will go to the president and his two deputies for ratification.